Winner of the Colorado Book Award in 2005 for non-fiction, Wild at Heart is one of the most exciting Colorado outdoors books available. This eminently useful and gorgeously illustrated field guide to the plants, mammals, birds, and ecology of Colorado’s High Country provides a library of fascinating information in a compact book that easily fits into daypacks or backpacks. Truly a comprehensive natural history guide, Wild at Heart encompasses Aspen and Snowmass Village, Colorado, and the surrounding wilderness areas of Maroon Bells-Snowmass, Holy Cross, Hunter-Fryingpan, and the Collegiate Peaks and beyond. Ultimately, this is a wonderful guide to all of Colorado’s High Country. 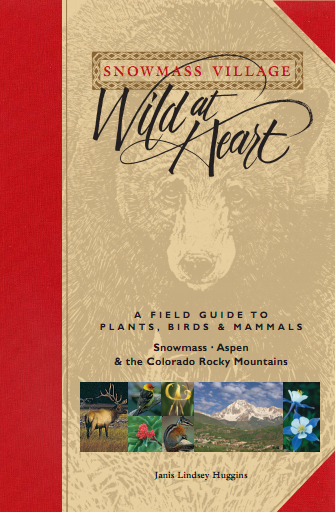 Called Snowmass Village: Wild at Heart in a tribute to the Town of Snowmass which helped fund this book, Wild at Heart will appeal to nature lovers all over the Southern Rockies. Not only does the book offer a detailed description and color photo for each of the 423 plants, 112 birds, and 49 mammals covered, but it also includes intriguing tidbits, statistics, and information on the natural history, myths, ecology, environmental status, herbal properties, and mountain life zones of these plants and animals. Janis is currently working on a revision to include more species of plants, as well moose which did not inhabit the Roaring Fork Valley area when Wild at Heart was originally published in 2005. She also has a fold up, laminated, quick reference guide by color, Wildflowers of the Southern Rocky Mountains, covering northern New Mexico, Colorado, and southern Wyoming. This waterproof guide is published by Quick Reference Publishing -quickreferencepublishing.com. It contains 101 common and rare native species with pertinent details for ID and vivid photographs. Check on Amazon or Barnes and Noble’s websites or check the publisher’s website for other locations in your area. This guide is a companion to Wildflowers of the Northern Rocky Mountains by William R. Gray, and together will give the reader ID for nearly 200 species to easily carry in their pack!